RACHEL COLLEEN (1998) The 59 foot salmon seiner Rachel Colleen was consumed by fire and lost July 30, 1998 in Cordova Bay near Ketchikan. All six crewmembers made it to safety. RADIO (1964) The 13 ton 35 foot wooden gas screw fishing vessel Radio was consumed by fire October 22, 1964 at Hoonah. The Rainbow was valued at $1,000 and had no cargo and no insurance. RAINBOW (1939) The 6 ton 30 foot wooden gas screw fishing vessel Rainbow was consumed by fire August 8, 1939 off the north side of South Indian Island. The only person aboard the vessel was able to get to safety. RAINER II (1982) The cabin cruiser Rainer II exploded, burned and sank February 20, 1982 in Carroll Inlet approximately 20 miles out of Ketchikan. The Rainier was valued at $7,000 and was a total loss. There was no insurance on the vessel. The crewmen all survived the disaster. RAINIER II (1954) The 8 ton 28 foot wooden gas screw fishing vessel Rainier II foundered September 16, 1954 at Point Stenord in Clarence Strait. The passengers and crew reached safety, assisted by the steamers Grand, Northwestern and Delhi. 75% of the cargo was salvaged, but the Ramona was a total loss. Ten days after the Ramona sank, divers were able to locate and recover a strongbox containing $150,000 in gold bullion. RANGER (1987) The 55 foot longline fishing vessel Ranger capsized and sank April 28, 1987 approximately 30 miles northwest of Sitka. All three crewmembers were picked up from their life raft by the U S Coast Guard. RASCAL (2009) The 36 foot wooden fishing vessel Rascal stranded and was lost October 11, 2009 on Saint Lazaria Island west of Sitka. The vessel had been at anchor and the master asleep when the grounding took place. The skipper, who was the only person aboard, abandoned ship as the vessel sank. He was in the water for an hour and a half before being rescued by a U S Coast Guard Helicopter and transported to Sitka. RAVEN (1940) The 12 ton 39 foot wooden gas screw fishing vessel Raven was consumed by fire July 14, 1940 on the cannery dock at Hoonah. The one person aboard made it to safety. RAVEN (2000) The 37 foot fiberglass trawler Raven capsized and sank while being towed March 23, 2000 in Sitka Sound, 12 miles from Sitka. The vessel had been holed by a stabilizer while hauling gear. The U S Coast Guard had dropped dewatering pumps to the vessel and the fishing vessel Seattle was enlisted to tow the vessel in to Sitka. The Raven capsized and sank on the trip in and the only person on board was rescued. REBEL (1973) The fishing vessel Rebel foundered and was lost November 6, 1973 in Frederick Sound off of the northeast coast of Kupreanof Island abeam of Big Creek and Cape Fanshaw. REDOUBT (1957) The 13 ton 39 foot wooden gas screw fishing vessel Redoubt burned August 11, 1957 at Chatham. REDWING (1954) The 6 ton 39 foot wooden gas screw Redwing was consumed by fire March 18, 1954 at Juneau. REFORM (1956) The 9 ton 34 foot wooden gas screw fishing vessel Reform foundered June 30, 1956 between Beacon Point and Twelve Mile Point in Frederick Sound. REGIS (1955) The 29 ton 52 foot wooden gas screw fishing vessel Regis stranded and was lost October 21, 1955 on Sullivan Island. The Reliance had a value of $3,000 and was a total loss. There was no cargo on board and no insurance. RELIANCE (1933) The 18 ton 40 foot wooden gas screw fishing vessel Reliance foundered off Tree Point March 15, 1933. The four crewmen aboard were lost with the Reliance. RELIANCE (1941) The 9 ton 31 foot wooden gas screw fishing vessel Reliance was consumed by fire at Ketchikan February 3, 1931. There was no one aboard at the time of the disaster. RELIANCE NO 3 (1953) The 10 ton 32 foot wooden gas screw fishing vessel Reliance No 3 was consumed by fire October 14, 1953 off of Naked Island near Funter Bay in Lynn Canal. The Resolute was valued at $1,500 at the time of the disaster. There was no cargo on board and no insurance. No lives were lost. The Restless, valued at $500, was a total loss. There was no cargo on board. REUBEN L RICHARDSON (1917) The 92 net ton schooner Reuben L Richardson was wrecked in Clarence Strait in 1917. REVENGE II (2001) The 86 foot fish tender Revenge II flooded, capsized and sank August 24, 2001 approximately 70 miles south of Sitka, two and a half miles west of Cape Ommaney. The Revenge II was hauling fish processing supplies to Cape Armstrong when her lazarette flooded while rounding Cape Ommaney. No bilge alarms sounded. Attempts were made to dewater the vessel but waves breaking over the deck hindered that effort and the vessel soon began to capsize. Both crewmen aboard were able to abandon ship in survival suits. They were rescued by the fishing vessel Monarch. The vessel was reported to have taken a large wave over the stern which may have broken a seam. REVIEW (1968) The gas screw Review was destroyed by a storm at Ketchikan November 28, 1968. REWARD (1999) The 38 foot fiberglass salmon fishing vessel Reward capsized and was lost June 16, 1999 in Sumner Strait. Inadequate stability was listed as the cause. The only person on board was rescued in his survival suit by the fishing vessel Tammy Sue. The U S Coast Guard cutter Anacapa also responded. REX (1942) The 8 ton 29 foot wooden gas screw fishing vessel Rex foundered June 29, 1942 at Kruzof Island in Sitka Sound. REX (1987) The 40 foot troller Rex sank November 1, 1987 southwest of Sitka. The U S Coast Guard found debris and a life raft, but no sign of skipper John Fowler. The Richmond had a value of $1,800 and became a total loss. There was no cargo on board and the crew made it to safety. RIPTIDE (2002) The 30 foot gillnet fishing vessel Riptide collided with the 51 foot fish tender Ola Jean and sank at 2:30 a.m. July 24, 2002 in Lynn Canal 20 miles north of Juneau. The crewmembers of the Riptide were taken aboard the Ola Jean and transported to Haines. RO-32 (1942) The 700 ton 243 foot Japanese I-Class submarine RO-32 was sunk by a combined attack of Canadian and U S aircraft and U S C G Patrol vessels July 9, 1942 approximately 21 ½ miles southwest of Cape Addington. ROALD (1946) The 8 ton 29 foot wooden gas screw fishing vessel Roald foundered January 18, 1946 in the vicinity of Horn Cliff at Lat. 56 ½ N Long. 133 W.
ROAMER (1951) The 57 ton 60 foot wooden oil screw Roamer stranded and was lost September 4, 1951 at Scraggy Point in Salisbury Sound. ROBERT G SEYMOUR (1975) The oil screw Robert G Seymour burned January 6, 1975 at Angoon. ROCKET (1978) The troller Rocket sank in heavy seas May 29, 1978 off of Cape Lynch on Prince of Wales Island. ROCKY PASS (2005) The 19 foot troller Rocky Pass disappeared March 15, 2005 on a trip from Kelp Bay to Angoon. The bodies of her two crewmen were found near Point Wilson on Admiralty Island. The two men had been commercial fishing for halibut near Kelp Bay when they were reported late for their return to Angoon. When found, one of the men was in an immersion suit but had been unable to zip it up because of corrosion on the zipper. The other crewmember had neither an immersion suit nor PFD. Lost were LeRoy H. Martin (47) and his son Frederick G. Martin (20), both from Angoon. The Rolfe, valued at $3,000 was a total loss. She was carrying no cargo. There was no loss of life. The Rolfe was insured for $2,623. ROLLING WAVE (1953) The 13 ton 36 foot wooden gas screw fishing vessel Rolling Wave was consumed by fire April 2, 1953 at the Thomas Basin Float near Ketchikan. 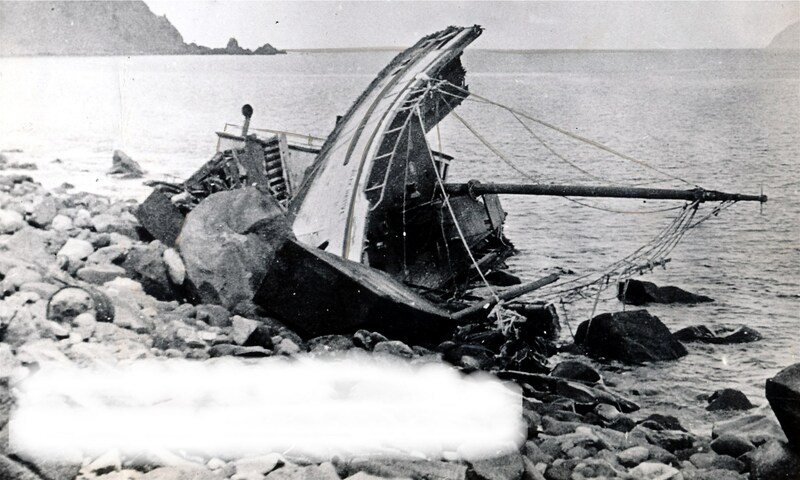 ROMAN (1916) The 230 ton British fishing schooner Roman stranded on Key Reef rock at high tide November 18, 1916 and was lost. The vessel struck the reef a few miles south of the south end of Zarembo Island in Clarence Strait near Wrangell and soon after sank in 20 fathoms of water nearby. The vessel was owned by a subsidiary of the British Columbia Packing Company of Vancouver and was on her way to the fishing banks at Snow Pass. She had five passengers on board and carried a crew of 30. She was on her way from Vancouver to sea fisheries and was carrying 25 tons of bait, 700 barrels of oil, 20 tons of coal, 100 skates of fishing tackle, 40 tons of ice and subsistence supplies for 36 people for a month. The value of the Roman was said to be $75,000 to $90,000. The schooner San Juan rescued the passengers and fishermen from the Roman and transferred them to the steam ship Admiral Evans. The blinker on Key Reef rock was said to be out of order which may have contributed to the loss. ROMANCE (1990) The 36 foot troller Romance rolled and sank February 27, 1990 in Wrangell Harbor. All four persons aboard, including two children, were rescued by another fishing vessel. None of those on board the Romance had survival suits or floatation devices. RONALD (1940) The 10 ton wooden gas screw Ronald was consumed by fire December 27, 1940 one quarter mile off Point Highfield. The two persons aboard made it to safety. ROSA (1985) The fishing vessel Rosa was surrounded by ice and sank February 5, 1985 in Marguerite Bay near Ketchikan. The Rosalee was valued at $800 and became a total loss, no cargo. The crew escaped to safety. The Rosalee had no insurance. The Rosario was carrying 2,000 pounds of fresh halibut at the time of the disaster. The vessel and her cargo were total losses. The crew made it to safety. The Rosario was valued at $3,500 and her cargo at $160. The vessel was insured for $3,000 but had no cargo insurance. The Rose was valued at $5,000 and damage to her was $5,000. There was no cargo and no insurance. No lives were lost. ROSE (1977) The tug Rose sank while moored at the Petersburg Boat Harbor June 1, 1977. The vessel ended up on Kupreanof Beach where she was abandoned. The Rose Marie, valued at $8,100, and her cargo of salmon were total losses. The vessel was fully insured but the cargo was not covered. No lives were lost. ROUGH DRAFT (1979) The fishing vessel Rough Draft wrecked December 19, 1979 in the vicinity of Inian Island near Elfin Cove. Both crewmembers were lost with the vessel. Lost were David Michael Kennedy and a second crewmember named Kennedy. ROUGHNECK (1986) The tug Roughneck rolled over and sank in Sergius Narrows April 10, 1986. Clyde Watson (55) of LaPine OR and Fred Davis (32) of Sitka were lost. The Roughneck was towing the barge Annahootz when the two jackknifed in the strong current forcing the Roughneck on to her side and sinking her. Captain Larry Holmes of Seattle, mate Bob Travinski of Vancouver and deckhand Brian Chinnel of Sitka were able to escape the sinking tug. The same tug and barge had been involved in another incident two days prior in Wrangell Narrows spilling a small amount of fuel. The Annahootz was carrying 460,000 gallons of diesel, gasoline and aviation fuel. ROYAL (1943) The 7 ton 30 foot wooden gas screw fishing vessel Royal was consumed by fire in Fish Bay on November 7, 1943. RUBY (1917) The 12 ton 35 foot gas screw fishing vessel Ruby foundered November 1, 1917 at Wrangell. There was no one aboard at the time of the loss. RUBY (1954) The 14 ton 48 foot wooden oil screw fishing vessel Ruby burned July 3, 1954 offshore in Tongass Narrows near Ketchikan. RUBY (1996) The 34 foot fishing vessel Ruby was consumed by fire and lost May 25, 1996 in Tongass Narrows. There was no loss of life. RUBY S (1961) The 8 ton 31 foot wooden gas screw fishing vessel Ruby S foundered October 27, 1961 near Duke Island. The Rustler had a value of $2,500 and her cargo of fish, $350. Both were complete losses. There was no loss of life. The Rustler was insured for $1,000 with no coverage for her cargo. RUTH (1945) The 6 ton 29 foot wooden gas screw fishing vessel Ruth stranded and was lost in Wrangell Narrows August 13, 1945. RUTH (1951) The 13 ton 32 foot wooden gas screw fishing vessel Ruth was lost September 13, 1951 after a collision with the gas screw Salome between Hoggatt and Red Bluff Bay. RUTH (1955) The 30 foot Hydaburg troller Ruth exploded and burned September 9, 1955 near San Juan Bautista Island between Craig and Hydaburg. Only Paul Deeds of the vessels five crewmembers was rescued. Three others were killed in the explosion including Duke Helmer (63), Al Lehman and Raymond Haldane (39). Owner Chester Bull (59) went missing and was presumed lost when he attempted to swim to shore. The explosion was caused by a dislodged gas line to the vessel’s engine leaking near the galley stove. RUTH (1959) The 32 foot fishing vessel Ruth burned March 21, 1959 off of Blank Island in Nichols Passage. RUTH A (1978) The gas screw Ruth A foundered November 8, 1978 in Alaska Native Brotherhood Harbor at Sitka. RUTH ANN (1959) The 135 ton 107 foot wooden oil screw fishing vessel Ruth Ann foundered October 22, 1959 at Wornoski (Woronkofski) Island. RUTH MAE (1970) The gas screw Ruth Mae was consumed by fire July 15, 1970 at the Port Protection fuel dock. The Ruth May had a value of $7,000 and was a total loss. There was no cargo on board. No lives were lost. The vessel had insurance for $6,700.